1 Bdrm Grnd flr Flat. Hall. Lounge. Kitch. Bdrm. Shower rm (CT band - A). Garden. Fixed price £79,995 Entry by arr. Viewing contact solicitors. Below Home Report Valuation (EPC band - D). 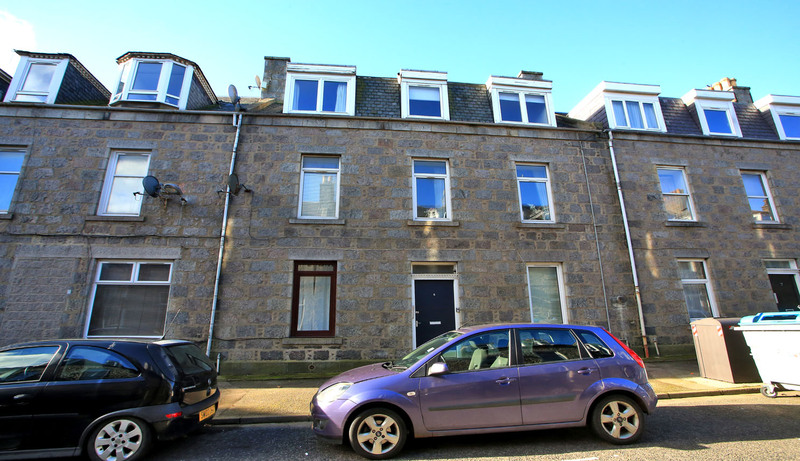 An ideal first time purchase and enjoying a popular city centre location just off Union Grove, this well presented one bedroomed ground floor flat forms part of a traditional granite building with the communal areas protected by a security entry system. Ready to move into with a minimum of inconvenience, internally the accommodation comprises of a welcoming hallway with feature archway, a lovely lounge with open fireplace and space for dining as required, and a modern well fitted kitchen with integrated appliances. 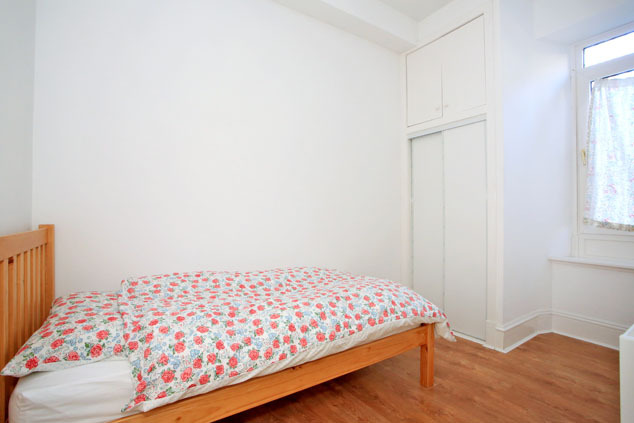 The bedroom enjoys built-in storage and a quiet location to the rear while the centrally set modern shower room completes the accommodation of this appealing property. With double glazing, there is a gas fired central heating combination boiler serviced in February 2017. 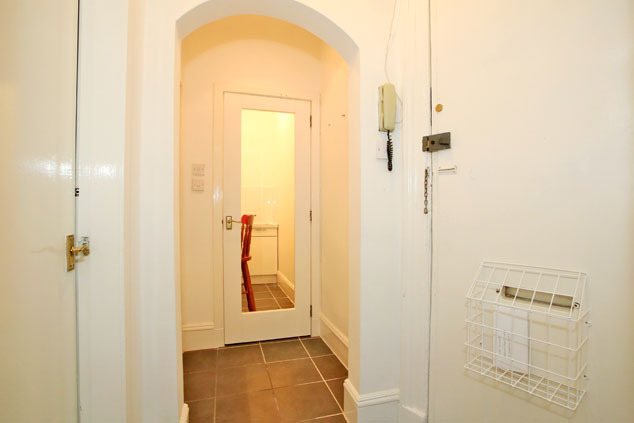 There is a half share of a cupboard within the hallway which has plumbing for an automatic washing machine and from the hallway a door gives access to the communal garden grounds. This is an appealing property of which internal inspection is recommended. 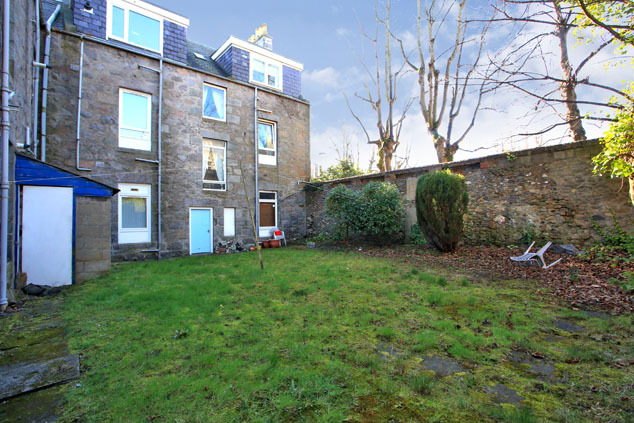 Granton Place lies between Union Grove and Claremont Street in the heart of the city. 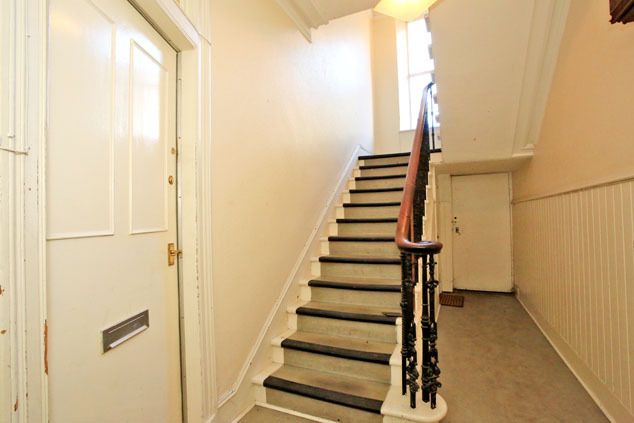 A number of local shops and amenities are within striking distance as is regular public transport to many parts of the city and the city centre itself which is only some five minutes walk away. Enjoying easy access to Anderson Drive, therefore to the business centres to the north and south of the city and Aberdeen Airport. The hospital complex at Forresterhill is only a short distance away. Communal Hall Protected by a security entry system the hall is neat and tidy with a door to the rear garden. There is a shared cupboard with plumbing for a washing machine. Hall 7’5” x 3’9” [2.28m x 1.14m] approx. Entered from a wooden door with Yale and Mortise locks, the hallway has white décor setting the decorative theme to the accommodation. With dark ceramic floor tiles, there are attractive doors, some of which are part glazed, leading to the accommodation. There is a high level meter cupboard and consumer box which was installed in 2015. Wall mounted security entry telephone. Coathooks for outdoor wear. Lounge 14’5” x 11’9” [4.40m x 3.58m] approx. into alcove Well proportioned and with a large window to the front affording great natural light to the room. 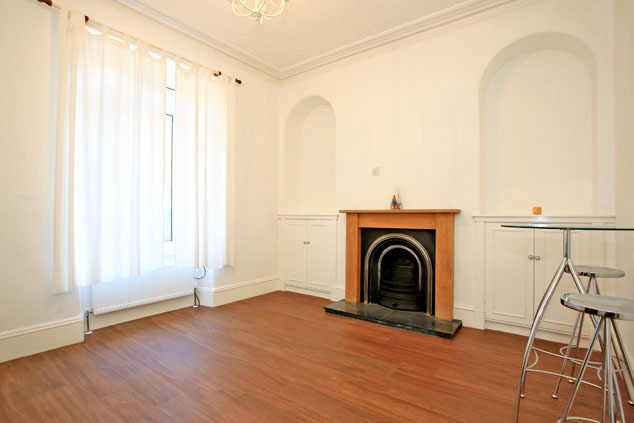 The tasteful white décor follows through from the hall and traditional features include a high ceiling with plaster cornice, deep skirting and two alcoves to either side of the chimney breast which have built-in shelved cupboards. The fireplace with oak surround, slate hearth and cast iron inset provides a lovely focal point and it is thought could be utilised as a functional open fireplace. The room enjoys oak laminate flooring, a ceiling rose with pendant style light fitting and the sofa and breakfasting table and two highchairs will remain. Kitchen 8’5” x 4’3” [2.57m x 1.30m] approx. 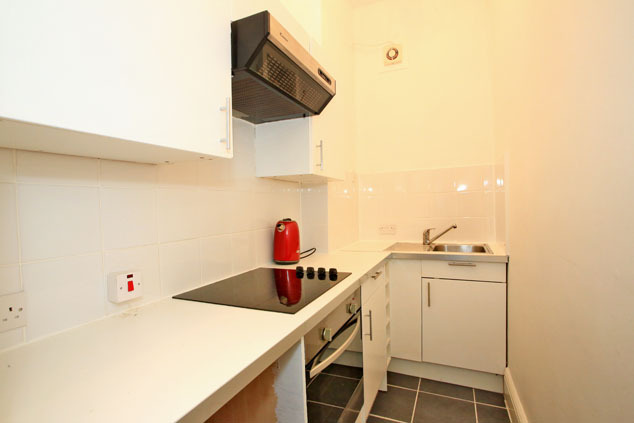 Fitted with a range of white wall and base units, incorporating nickel rod handles, co-ordinating worktops with splashback tiling and an inset stainless steel sink with mixer tap. There is an integrated fan assisted oven, a ceramic hob and concealed extractor hood above. There is space for a fridge, a wine rack and track spotlight fitting. 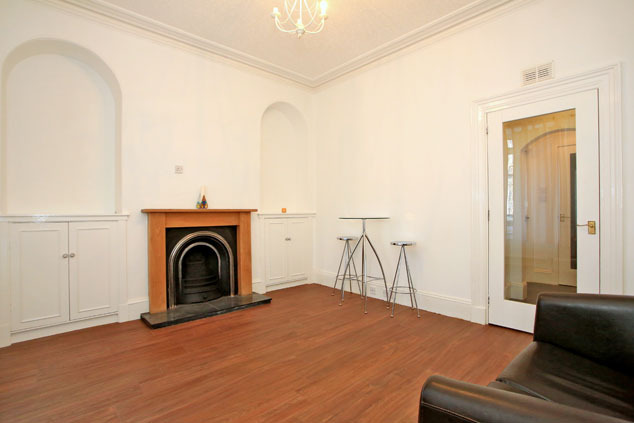 Decorated in white tones, there are contrasting grey ceramic floor tiles and a glazed door to the hall. Bedroom 12’11” x 6’11” [3.96m x 2.12m] approx. 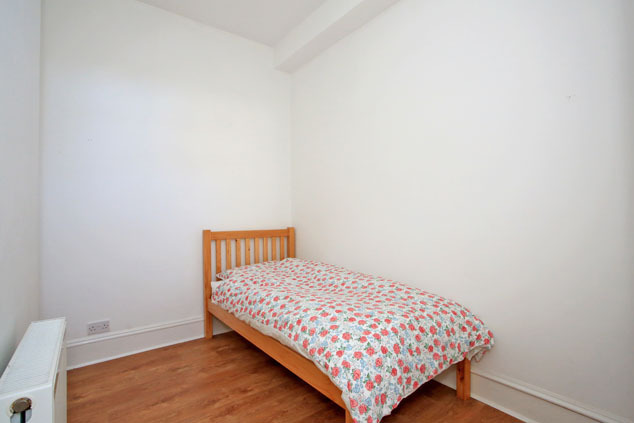 Enjoying a quiet location to the rear with a tall window overlooking the garden, this room again enjoys attractive wood laminate flooring and white décor. A built-in wardrobe provides hanging and shelving storage and there are high level cupboards concealing the gas fired central combination boiler. The single bed will remain. Shower Room 8’9” x 4’4” [2.67m x 1.34m] approx. into shower. Centrally set, this modern shower is of a good sized and fitted with a pedestal wash hand basin with mixer tap, w.c. and a shower unit with mains thermostatic shower, glazed doors and extensive tiling to the shower unit. 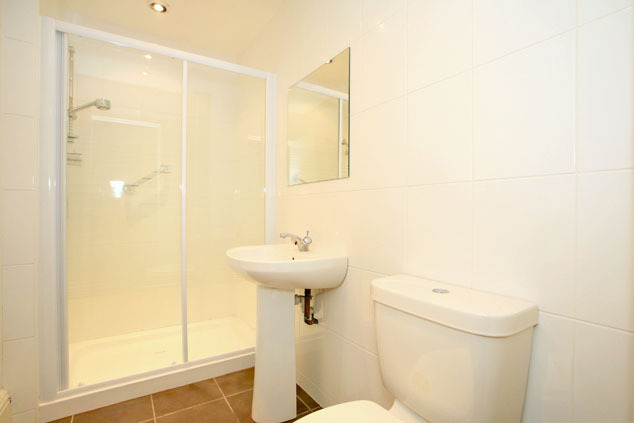 The room has ceiling downlighters, an air extractor and chrome heated towel rail. Wall mirror and fittings to remain. Outside To the rear the communal garden is laid to grass and bound by a high traditional wall. Notes Gas fired central heating with combination boiler. Double glazing. EPC=D. Communal security entry system. 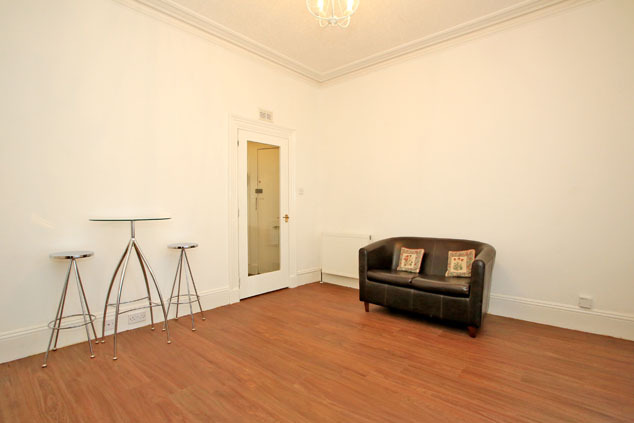 The flat is being sold as seen inclusive of all curtains, light fittings, integrated appliances and items of furniture.